I’m pleased to announce my second app for the Windows Phone 7 platform. The application follows in the footsteps of Fifty States app, offering a crafted application experience for tracking your visits to the 58 US National Parks. As you may have seen in my earlier post about creating a National Park Checklist wall poster, I have incredible appreciation and passion for these protected lands which have been set aside due to their unique natural and cultural beauty. I’ve created this app to help you engage with the parks more fully, track the places you’ve been, and inspire your next adventures. New features in the ‘National Park Checklist’ app. 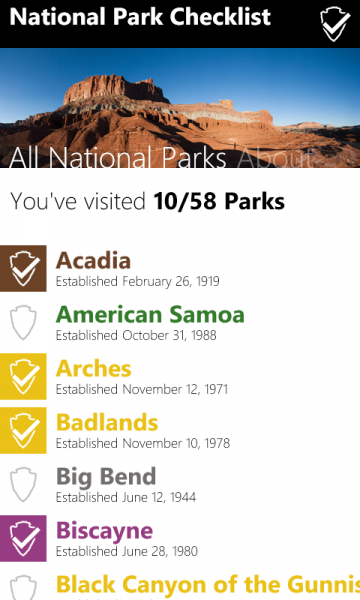 I am particularly pleased with the visual styling I was able to achieve with the National Parks app. I definitely drew inspiration from the National Park Unigrid System that is used in official park literature. It relies on a bold black heading with white text on all materials, and aligning content to strict grids to ensure readability and consistency on literature which is folded. I’ve incorporated photographs (taken by me and my wife) of many national parks. which provide a random heading for the home page, and provide context when looking at a specific park such as Haleakala (see below.) I hope to get additional images for the remaining parks. I also color-coded the National Parks by region to give users a way to break the insurmountable goal of visiting 58 disparate parks into more achievable goals. The color coding was carefully selected to match the coloring used in the ‘Passport to your National Parks’ program. I have owned a National Park Passport since ’92 and nearly filled several sections during several family road trips starting in ’93. The program is a great way to motivate people to visit the parks and have a stronger connection with each visit. 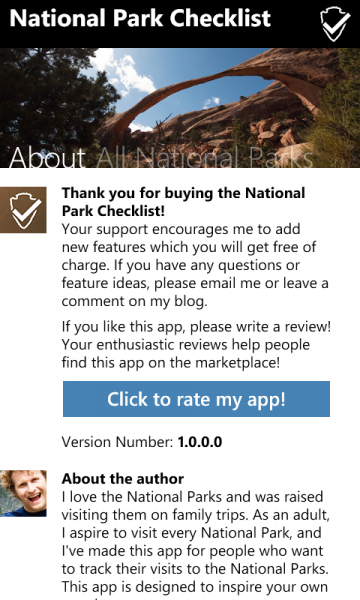 If you have a Windows Phone 7 and would like to try my application, please click this link to Download the National Park Checklist application using the Zune Marketplace for Windows Phone 7. If you like it, please rate the application and leave a comment on the marketplace. This will help others find and enjoy this application. As always, please send me an email or leave a comment below if you have questions, ideas, feedback or bugs for me. Thanks! WPCentral.com picked up the story of Fifty States / National Park Checklist. They included screenshots of both apps, and a video highlighting the basic features of both apps. P.S. A significant update for Fifty States was just approved and should be available now, and an update for the National Park Checklist is in the queue which improves the add/edit visit experience and adds a color-coded map shwoing the park regions. Colin: Thank you for the support and encouragement. I have enjoyed both developing for and using the Windows Phone platform. I hope you do get a WP7 soon, and are able to give my apps a try. Tom: can park tracker be used witht he widnows 6.5 platform? based on what I have seen with 7 I am not planning on upgrading any time soon. David: The application is only for Windows Phone 7 at this time, and I do not plan to ever offer it for WP 6.5. A couple years ago I switched from a WP 6.5 to an iPhone and recently switched to a WP7 phone. Each has been better than the previous phone. You should give WP7 a try. 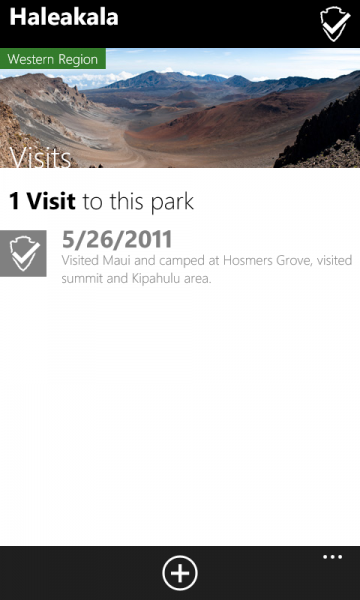 I would love to see the National Park Checklist app for Android and iPhone. Really sad that I can’t use it on my Droid. I purchased the app and I really like it. However, after a week, it starts to reset all my visit input information to zero. It happened 4 times already since yesterday. Any idea why? that is strange, and probably has to do with the way the phone suspends apps. Can you provide any details about your phone / OS Version? I have Nokia 710 with WP7.5. like to shoot you an e-mail. I’ve got some ideas for your blog you might be interested in hearing. Either way, great site and I look forward to seeing it expand over time.